Jetstream Tours was the creation of the company director, Richard Bain, in 2013. Richard has always had a passion for boats and has worked on the river since 2001. He initially entered the family business of supplying workboats and tugs from Gravesend but soon ventured off to roles within other river-based businesses in London. 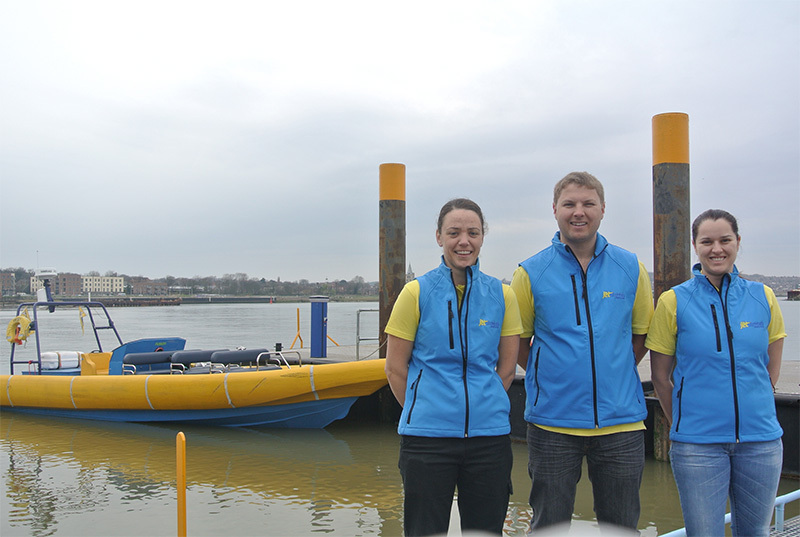 In 2014, Jetstream Tours started trading with a small and agile vessel, “Twist”, a 9m aluminium Jetboat offering river safaris and thrill rides. The tours were a resounding success and allowed visitors in Medway an opportunity to use the river and to discover Chatham Historic Dockyard and its fascinating naval history. Over the next few years, Jetstream Tours has worked tirelessly to maintaining and improving its jetboat service, striving to ensure its customers were 100% satisfied with the service they received and our success is down to our team of committed staff members. We understood the initial complications with “Twist” as she is a seasonal vessel and only appealed to the fit and able bodied sailors. In a five year plan the company aimed to provide Medway with a slower and more accessible tour suited for younger families. We made it possible in just three. Towards the end of 2015, Richard started venturing to many ports to locate a larger sightseeing vessel, one that could take a larger number of passengers out on relaxing commentated tours of Rochester and Chatham. The answer was found in the Channel Islands. In February 2016, Jetstream Tours secured it’s second vessel, Jacob Marley. This unique vessel ticked every box on the companies wish list. Capable of carrying up to 100 persons with disabled access, a bar, toilets and low enough to pass underneath Rochester Bridge. By April, Jacob Marley made her 32-hour voyage from Jersey to the River Medway. Now passengers of all ages and abilities can see the beauty of the River.